At Extreme Linings and Coatings we work with several different companies each offering their own unique products. Because of this we are able to offer our customers an enormous variety of linings and coating solutions from flooring to polyurea and polyurethane sprays and much more! Concrete floor looking rough? Ask us about flake flooring solutions, a fast and extremely durable concrete floor coating available in a wide variety of styles and colours! Our linings can be installed pre or post construction on new or existing concrete floors and give extreme durability for high traffic areas. Your new flooring will be very low maintenance with a quick installation time, which means less down time for you. We also offer structural repair systems for cracks, spalls and joint restoration. Non-slip anti-skid options for wet or oil saturated floors make linings an affordable and cost effective solution for all concrete flooring. Being ‘green’ is important to you (and us! ), so we offer VOC free options. 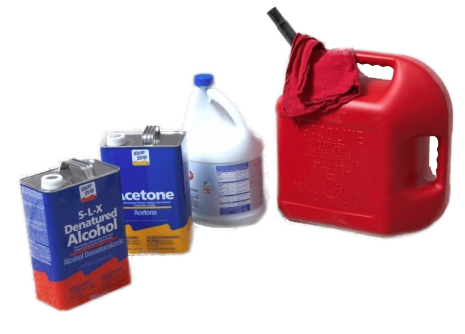 Tired of rust and corrosion? Our polyurethane and polyurethane coatings are not only durable, they put a stop to leaks, rust and corrosion greatly extending the life of your investment! 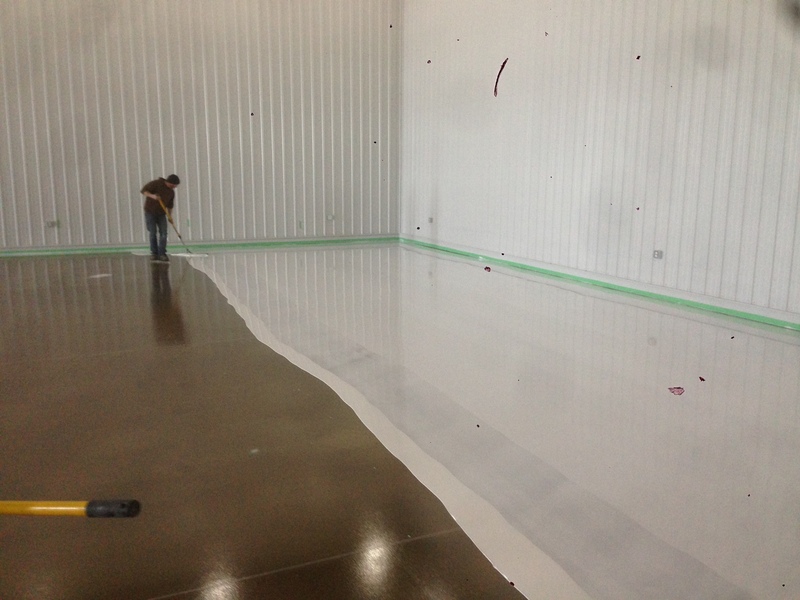 A floor coating is one of the most economical and aesthetically pleasing ways to enhance a plain gray concrete floor. These heavy duty epoxy-based systems not only upgrade the look of the floor, they also increase resiliency to stains and tire marks and hide minor imperfections. Designed for industrial, manufacturing and warehouse facilities, our flooring systems are time tested and proven for long term durability. Our flooring systems also product a nearly maintenance free finish strong enough to take constant vehicular and heavy duty forklift traffic. Concrete is one of the most widely used products in all the construction industry for pedestrian and vehicular traffic and yet people simply accept that it is gray, plain and blah. Property owners spend thousands of dollars on landscaping, paint, architectural upgrades and more to improve the look of their property; so why not improve the look of their existing concrete as well? 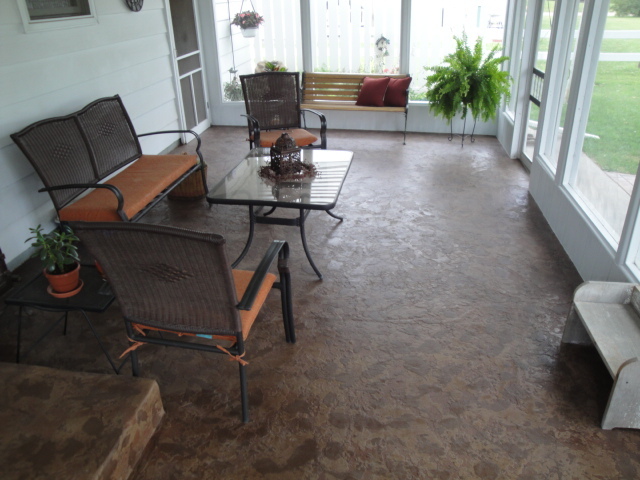 With decorative concrete, we can do just that. No tear our or replacement required, these applications are tough–strong enough to take the abuse of constant vehicular traffic. 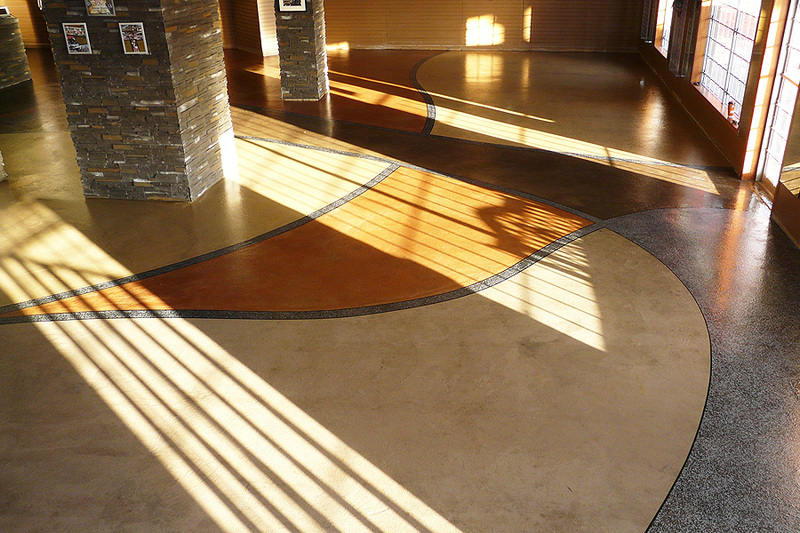 Available in any colour combination you desire, we can match your decorative concrete to surrounding design and theme. You have complete project customization in terms of texture, pattern, colour, design and depth. Did we mention our decorative concrete exterior finishes are so strong that they can handle vehicular traffic? Applied with heated, plural component pump & spray equipment, Chemline extends life of concrete with excellent adhesion & low shrinkage. The Concrete Solutions® specialists have spent the last two decades developing products and systems that restore and resurface concrete to its original condition. Rhino Linings Corporation now offers a family of proven coating solutions for residential and commercial flooring applications, including polyaspartic and epoxy. Rhino Linings Industrial designed spray polyurethane foam insulation and sealants that are used to protect against abrasion, corrosion, impact, and slipping vibration. Elite Crete Systems is world leading manufacturer of specialty concrete flooring and coating products for repair and performance protection of all flooring. We use only the best products for the job. If there is another brand, product or application you are searching for, contact us today for more details on our available products and systems. Tired of shovelling snow, or don’t have time in the mornings before leaving for work? Extreme Linings and Coatings now offers snow removal services. Whether you have a small, private driveway or a large commercial parking lot, let us take care of it for you. 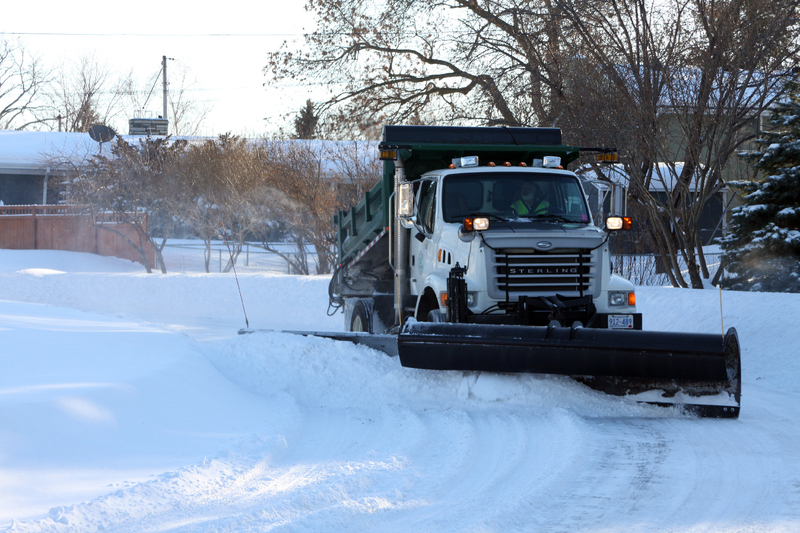 Our team monitors the weather closely to ensure that all snow is removed in a timely manner, making it safer for you and your family or employees to get around. With state of the art equipment, you can rest easy knowing that Extreme Linings and Coatings is on the job. We offer commercial or residential plowing with salt and sand services by contract or by the trip. Over time, pool finishes get pitted due to chemical wear and sunlight. If you notice that your pool surface is cracking or pitting, there is a good chance you need resurfacing. This will help to keep your water balanced and clean and give your pool a much longer life span, and it will also help to prevent leaks in your pool finish. At Extreme Linings and Coatings, we offer a variety of different coatings, colours, and options for your pool resurfacing. Much like your pool, your deck also deserves a touch up. This will help to extend the life of your deck and improve the overall appearance of your backyard oasis. 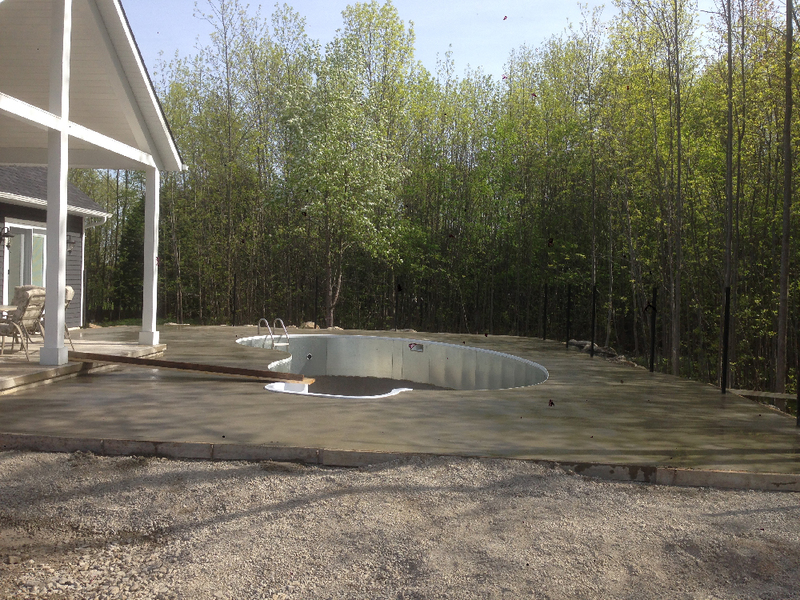 Cracked or broken decks are a safety hazard to you and your family, so let us take care of you so that you can get back to enjoying your dinner on the deck. Give us a call today and we will be happy to look at your job with you and provide you with a no obligation quote. Located in Owen Sound and servicing the Grey, Bruce and Simcoe area since 2011.